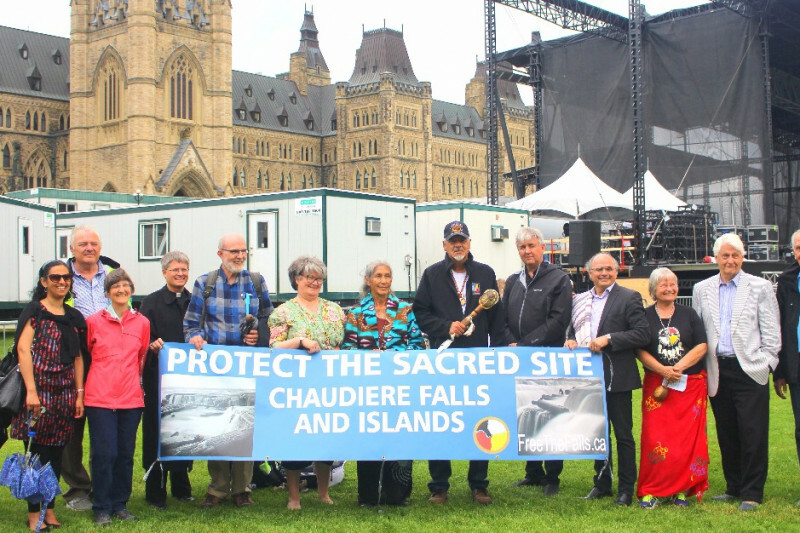 I called for the "Faith Is Peace: Walk for Our Sacred Site, Akikodjiwan." The walk for our sacred site was a huge success. But we did not have time to fundraise before the walk. Now we need your support! The “Faith is Peace” walk was for me “prayer in motion.” I think we can all agree on that! Each step taken, proclaimed to all spirit of Creator Land that all religions and faiths in the Ottawa Region now stand as one against hatred, against division and against any individual who defiles or desecrates any of our sacred sites. It was good to walk in peace and in love for all! But as it is with all things good, there is always a little something of a drawback to deal with. Bills need to get paid. We were very fortunate to have the generous support of Maurice Switzer and Andrée Cazabon. Maurice emceed our event, travelling from North Bay to do so. He donated his time, energy and talent to our cause. Andrée did the trench work, out of the limelight, with grace and fortitude. What an amazing young woman and leader she is! There are many others who donated their great gifts in communications and areas of administration. This walk would never have occurred if not for Judith Matheson, Maureen Stark, Debra Huron, Pamela Schreiner, Daniel Stringer, Peter Stockdale, Janyce Elser, Anne-Marie Hogue, and Ravinder Roberts-Dunsmoor. I believe the Freeing Chaudière Falls and its Islands (AKA Free the Falls) group deserves the biggest applause. This dedicated circle of precious human beings gave of their time, talents and even money (the group paid $590 for the great sound system) to make our event one we will remember with enormous fondness far into the years to come. There are other bills which must get paid, too. The Big Drum from Pikwakanagan and the travel expenses of elder Rose Wawatie and up and coming leader Shannon Chief. Costs for this amount to a total of $720. Could we have had the success we did without the tireless Julie Comber looking after admin. and other concerns for us? I don’t think so. Julie was the Coordinator of the Faith is Peace organizing committee. She posted a GoFundMe campaign to fundrase for part of the honorarium we want to give her. Grandmother Jane Chartrand and myself are requesting that folks “pass the hat,” so to speak, and help pay these bills. If funding is not forthcoming, it will mean that the elders involved will have no choice but to absorb these costs. Not fair! We will keep you posted as to how the people respond. If donations surpass the amount needed for bills, the extra funds will go towards next year’s walk. $720 - Travel expenses of Anishinabe attendees; Paid by Albert Dumont. $580 - Amount remaining for Julie Comber's honorarium. This honorarium is a thank you for 30 hours of organizing work (actually it was many more hours of work): $750. Plus $40 for child care the day before the walk because Julie needed more time to work. Plus a $60 e-transfer to one indigenous participant for travel expenses. TOTAL: $850. Julie raised $270 before this current campaign was set up, so $580 is left. Migwech (Thank you), Freeing Chaudière Falls and its Islands , for paying $590 for th excellent sound system. TOTAL left to raise: $1300. If we raise more than $1300, it will go towards funding next year's sacred walk. Migwech! The elders and organizers of the Faith is Peace walk are so grateful for this tremendous support. Thanks to your generous support we have surpassed our goal! All the outstanding bills are paid, and Free the Falls will hold the extra funds in trust for next year's walk.